Alexandros (Alex) was born in Berlin, Germany and raised in Athens, Greece. He completed his undergraduate degree in Chemistry and his master’s degree in Chemical Analysis & Quality Control at the National and Kapodistrian University of Athens. 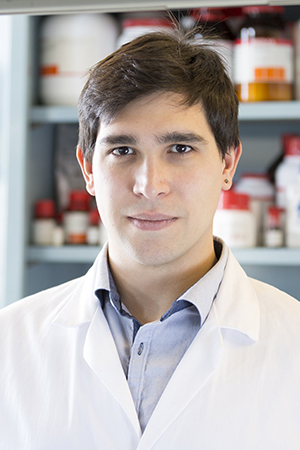 Since April 2016, Alex has been a member of the Wheeler Group and since September 2016 a PhD student at the University of Toronto. During his Masters, Alex strived to synthesize various novel organic compounds with applications in Analytical Chemistry and develop Analytical methods based on his results. Particularly interested in the easy and cost-effective fabrication of Digital Microfluidic (DMF) devices, his current research focuses on the field of electrochemistry with the goal to couple electrochemical detectors with DMF. Outside of the lab, Alex likes to cook, tinker with his 3D printer and explore the city. He recently has taken up ice skating and as a result developed a need for Advil.